The Modified Bröstrom stabilization is commonly performed for chronic lateral ankle injuries. 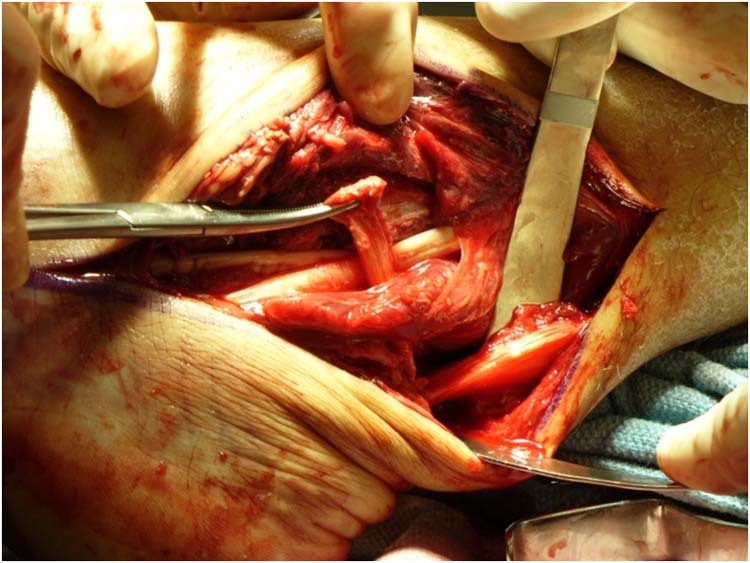 However, tissue viability, chronic injury, and/or injury severity may require a non-anatomic repair necessitating a tendon transfer. We present a series of 9 consecutive cases of Modified Bröstrom stabilization with OrthADAPT™ Bioimplant augmentation with 9 month follow-up. The average pre-operative Visual Analog Pain Score (VAS) was 5.78 out of 10 (range 5-8, SD 1.09). The mean duration of physical therapy was 2.3 months (range 6 weeks – 3 months). The mean length of time from surgery to discharge from care was 4.4 months (range 4-6 months). VAS was reduced to an average of 1.89 post-operatively at time of discharge from care (range 0-3, SD 1.05). The results were statistically significant (p>0.0001) at a 95% confidence interval. We conclude that the OrthADAPT™ Biologic Collagen provides support for augmentation and enhance the stability of the Modified Bröstrom procedure. 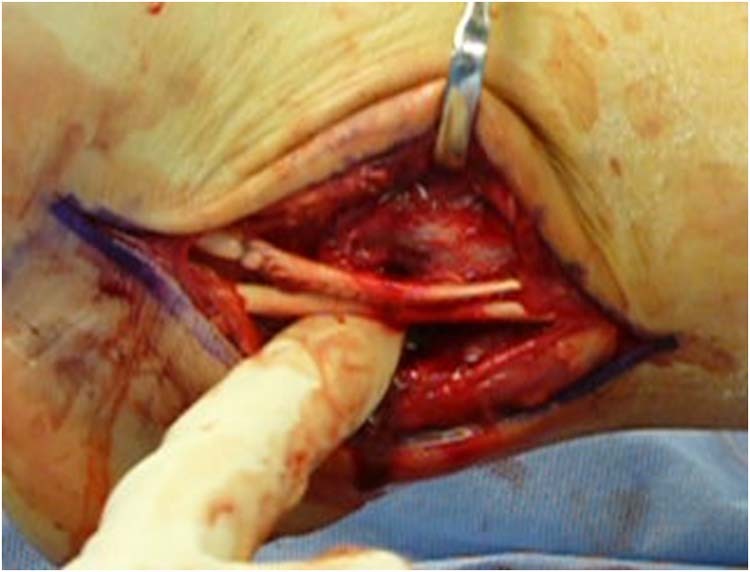 Additionally, it may prevent the need for tendon transfer and its inherent complications. This creates a need for additional surgery and rehabilitation with all its associated complications. 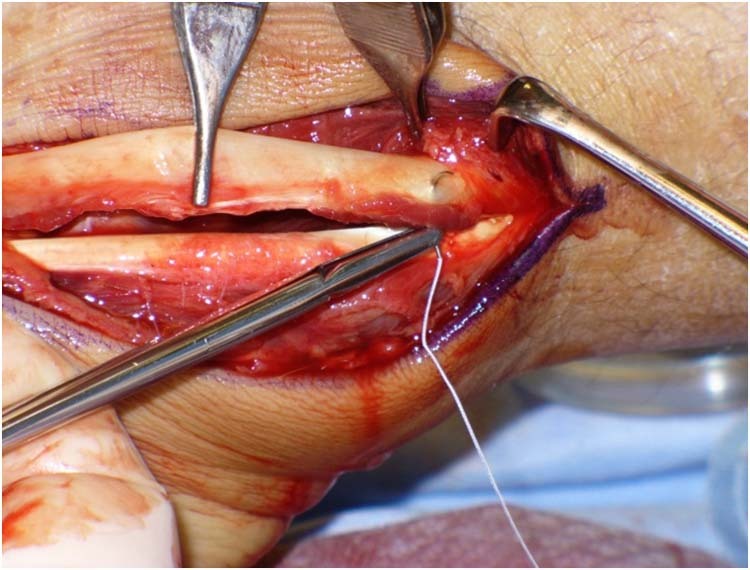 [4,5,6] A novel use of a biologic collagen implant (OrthADAPT™ Bioimplant, Pegasus Biologics, Irvine, CA) is described, which strengthens the Bröstrom-Gould repair and obviates the need for additional tendon harvesting. The OrthADAPT™ Biologic Collagen Implant is a biologic scaffold that provides support for augmentation by fortifying and promoting tissue ingrowth to enhance the stability of the reconstruction procedure. 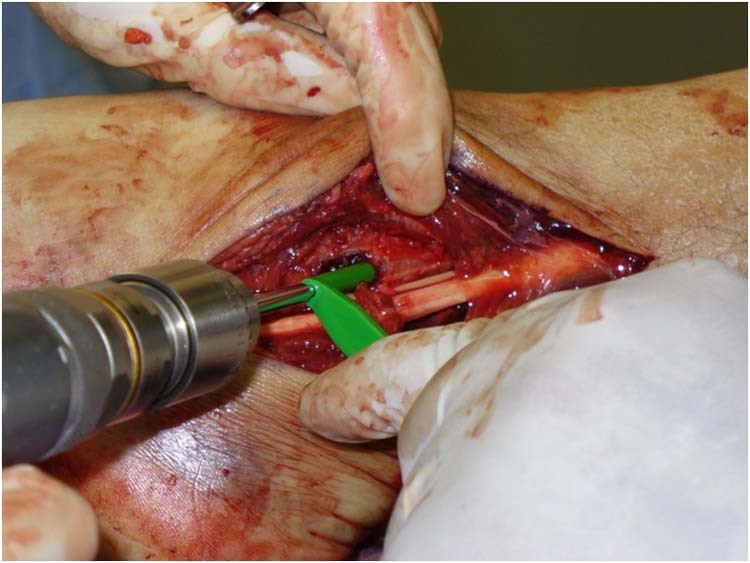 The purpose of this paper is to illustrate a new surgical technique using the Pegasus OrthADAPT™ Bioimplant for augmentation of the modified Bröstrom procedure for reconstruction of the lateral ankle ligament complex. A case series of 9 patients with 9-month follow-up is also presented. The procedure is performed in the supine position under sedation with local infiltration. A roll is placed under the ipsilateral hip to allow for internal rotation of the leg and easy access to the surgical site. A high-ankle tourniquet is used for hemostasis. 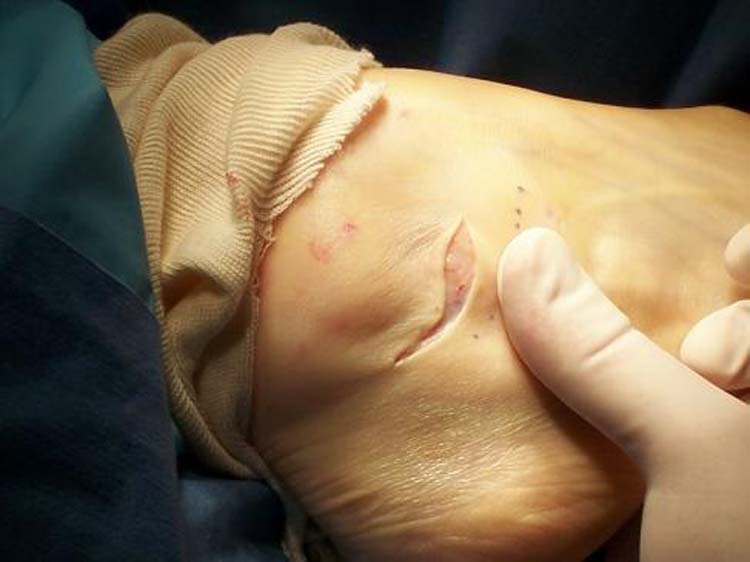 The incision is made just below the tip of the distal fibula and extended dorsally across the skin tension lines along the anterior fibula. 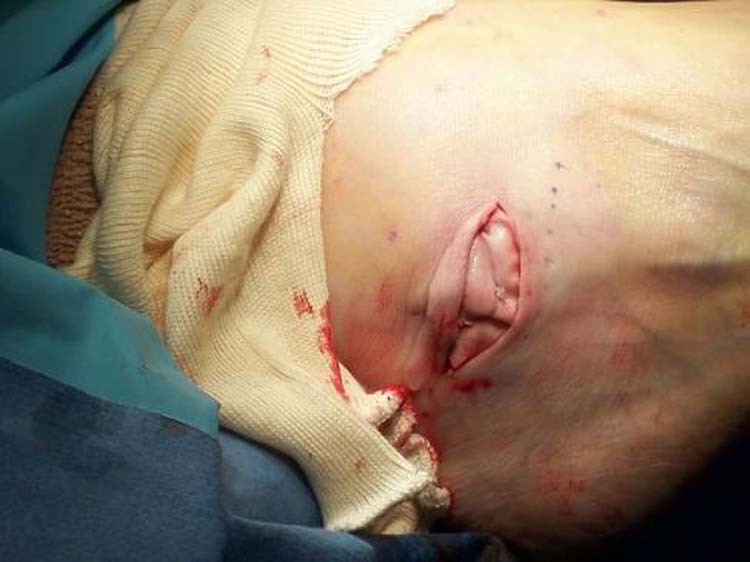 Figure 1 Incision is made over the ATFL. 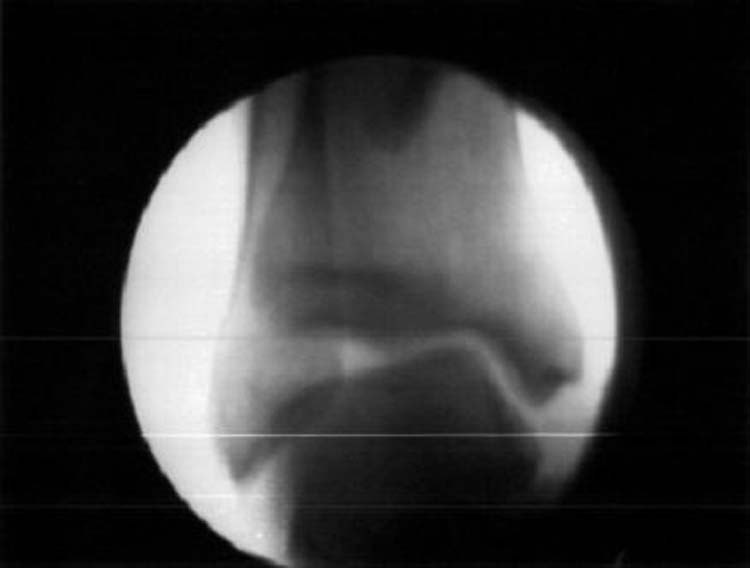 Figure 2 Anterolateral ankle capsule and ATFL sectioned. The lateral talar dome may be inspected for the presence of any osteochondral lesions or osteophytes, and are corrected if present. Figure 3 Pants-over-vest repair of the ATFL. Figure 4 OrthADAPT™ implant strip. 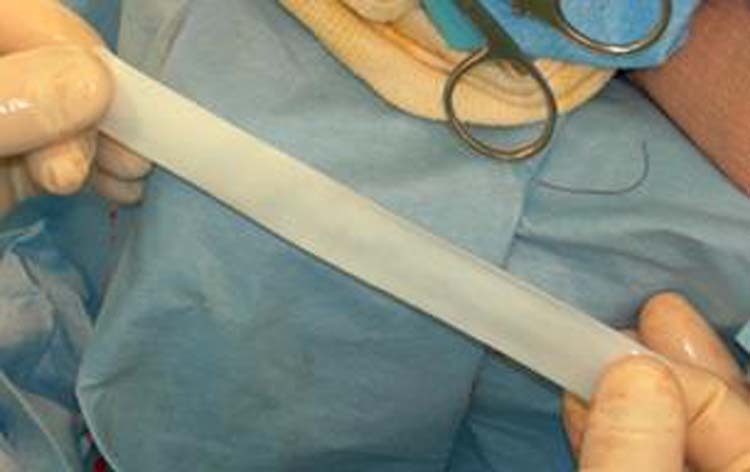 Figure 5 OrthADAPT™ implant is fashioned into a cable. 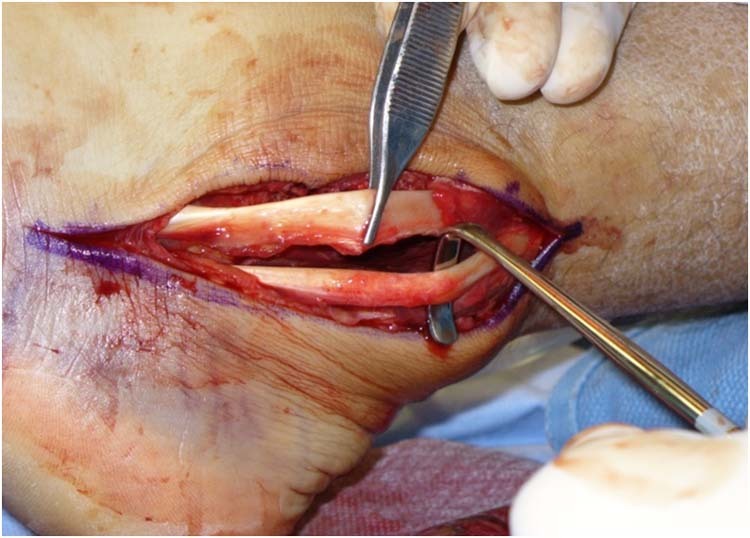 Figure 6 Hemostats are placed under the repaired ATFL to fascilitate weaving of the implant. Figure 7 The implant is woven across the repaired ATFL. 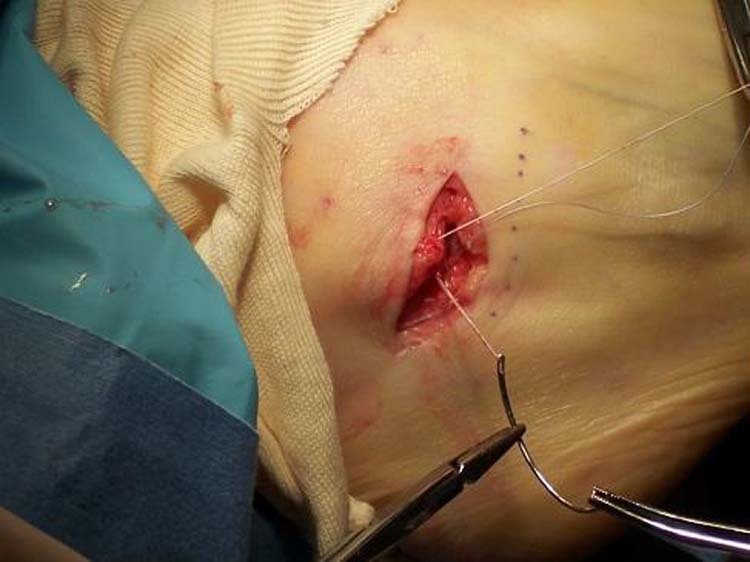 Figure 8 OrthADAPT™ implant patch over the repair. The patient is maintained in a non-weight bearing short-leg cast with slight inversion for the initial first 3 weeks, and then progresses to a walking boot for the next 3 weeks. An intense physical therapy protocol is initiated after the cast is removed. A Stromgren® ankle brace is used for the next 6 weeks and with activity for the next 6 months. Non-contact sports may be initiated after 6 weeks, with any activity restrictions lifted at 3 months. 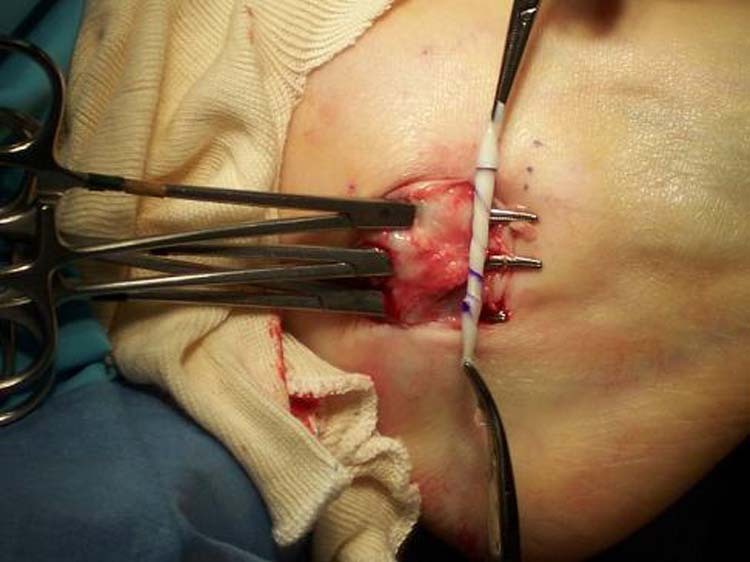 Nine cases of augmented Bröstrom repair using OrthADAPT™ implants were performed from April 2006 to September 2007. All cases were unilateral; 6 had chronic ankle instability and 3 were acute-on-chronic in nature. Seven patients were female and two were male. The age range was between 24-58 years old. Patients who had associated injuries or needed additional surgery, such as peroneal augmentation, were excluded from the study. A Wong-Baker Faces Visual Analog Score (VAS) was administered to each patient and recorded pre-operatively and at each post-operative visit. The average pre-operative VAS was 5.78 out of 10 (range 5-8, SD 1.09). The average duration of physical therapy was 2.3 months (range 6 weeks – 3 months). The average length of time from surgery to discharge from care was 4.4 months (range 4-6 months). VAS was reduced to an average of 1.89 post-operatively at time of discharge from care (range 0-3, SD 1.05). The results were statistically significant (p>0.0001) at a 95% confidence interval. There was one complication in this series that resulted in an explant. The patient complained of an “overstuffed” feeling in the area of the repair which was causing irritation in shoes. There was skin breakdown which exposed the patch repair. The patient was brought into the operating room and the patch was removed. Upon inspection, there was no issue with the weave portion of the repair, and it was left intact. The time from implant to explant was 3 months and this subsequently healed uneventfully. The integrity of the ankle ligaments should be assessed on physical examination. This examination can be difficult at times due to patient guarding. A high ankle block with lidocaine or bupivicaine may aid with patient compliance to the examination. A positive anterior drawer sign of >5mm than the contralateral side or 10mm of absolute translation indicates that there has been compromise of the ATFL. A talar tilt of <10 degrees indicates injury to the CFL. Figure 10 demonstrates a positive talar tilt on fluoroscopic examination. Figure 10 Positive talar tilt on fluoroscopic examination. The OrthADAPT™ Biologic Collagen Implant is a biologic scaffold that provides support for augmentation by fortifying and promoting tissue ingrowth to enhance the stability of the Modified Bröstrom procedure. Additionally, it may prevent the need for tendon transfer and its inherent complications. 1. Kuhn MA, Lippert FG. Revision lateral ankle reconstruction. Foot Ankle Int. Feb;27(2):77-81, 2006. 2. Nimon GA, Dobson PJ, Angel KR, Lewis PL, Stevenson TM.A long-term review of a modified Evans procedure. J Bone Joint Surg Br. Jan;83(1):14-8, 2001. 3. Sammarco GJ, Idusuyi OB. 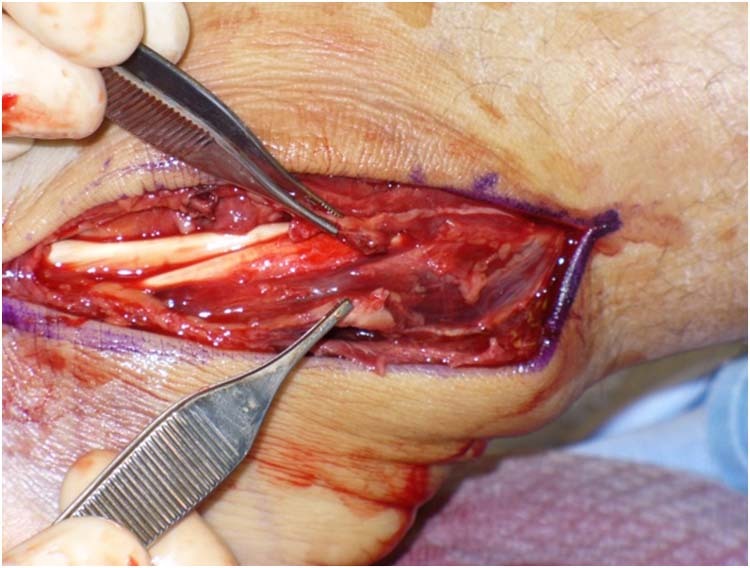 Reconstruction of the lateral ankle ligaments using a split peroneus brevis tendon graft. Foot Ankle Int. Feb;20(2):97-103, 1999. 4. 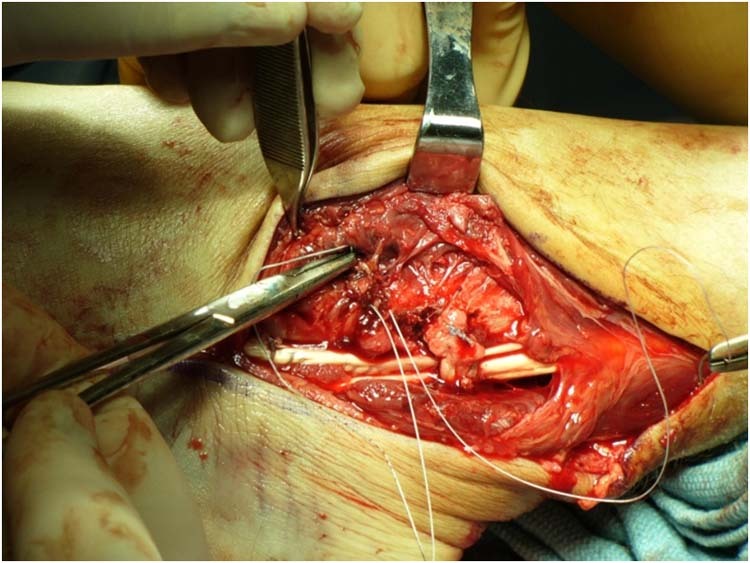 Sugimoto K, Takakura Y, Kumai T, Iwai M, Tanaka Y. Reconstruction of the lateral ankle ligaments with bone-patellar tendon graft in patients with chronic ankle instability: a preliminary report. Am J Sports Med. May-Jun;30(3):340-6, 2002. 5. 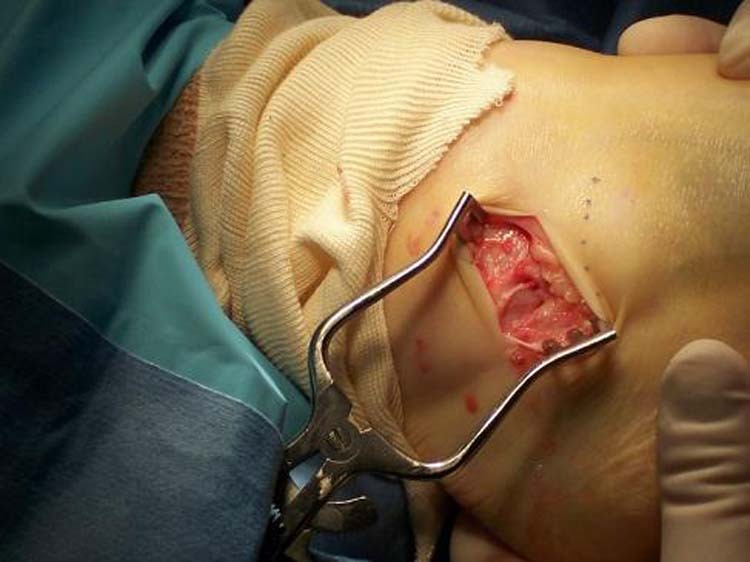 Coughlin MJ, Schenck RC Jr, Grebing BR, Treme G. Comprehensive reconstruction of the lateral ankle for chronic instability using a free gracilis graft. Foot Ankle Int. Apr;25(4):231-41, 2004. 6. Marsh JS, Daigneault JP, Polzhofer GK. Treatment of ankle instability in children and adolescents with a modified Chrisman-Snook repair: a clinical and patient-based outcome study. J Pediatr Orthop. Jan-Feb;26(1):94-9, 2006. 7. 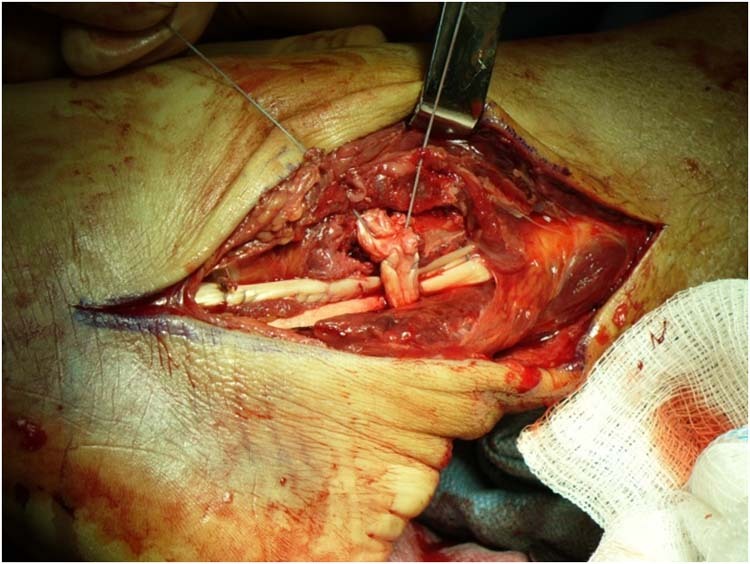 Komenda GA, Ferkel RD: Arthroscopic findings associated with the unstable ankle. Foot Ankle Int 20:708–713, 1999. 8. Becker, HP; Rosenbaum, D: Chronic recurrent ligament instability on the lateral ankle. Orthopaedics 28:483 – 492, 1999. 9. Peters JW, Trevino SG, Renstrom PA. Chronic lateral ankle instability. Foot Ankle. Dec;12(3):182-91, 1991. 10. DiGiovanni, BF; Fraga, CJ; Cohen, BE; Shereff, MJ: Associated injuries found in chronic lateral ankle instability. Foot Ankle Int. 21:809 – 815, 2000. 11. Bulucu C. Biomechanical evaluation of the anterior drawer test: the contribution of the lateral ankle ligaments. Foot Ankle. Jun;11(6):389-93, 1991. 12. Hamilton WG, Thompson FM, Snow SW. The modified Bröstrom procedure for lateral ankle instability. Foot Ankle 14:1-7, 1993. 13. Hamilton, WG. Current concepts in the treatment of acute and chronic lateral ankle instability. Sports Med. Arth. Rev., 2:264-266, 1994. 14. 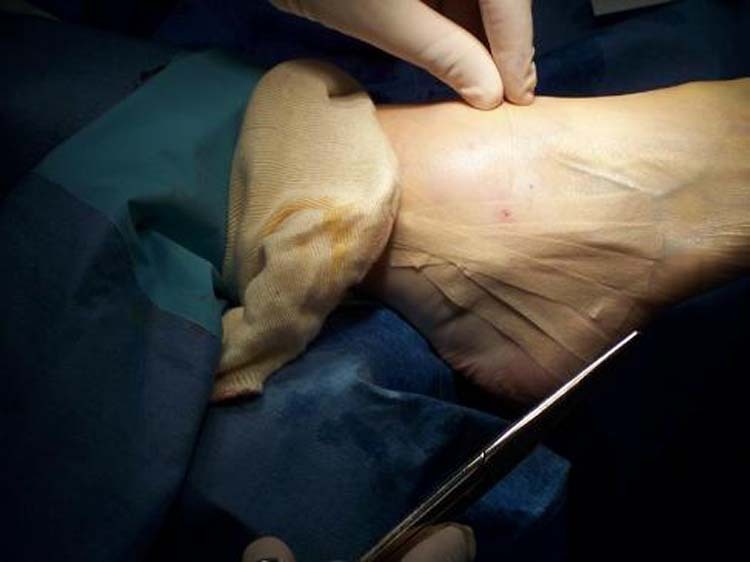 Baumhauer JF, O’Brien T. Surgical Considerations in the Treatment of Ankle Instability. Journal of Athletic Training 37(4):458–462, 2002. 15. Colville M. Reconstruction of the lateral ankle ligaments. Instr. Course Lect. 44:341 – 348, 1995. 16. Girard P, Anderson RB, Davis WH, Isear JA, Kiebzak GM Foot Ankle Int. Apr;20(4):246-52, 1999. 17. DiGiovanni CW, Brodsky A. Current Concepts: Lateral Ankle Instability Foot Ankle Int 27: 854-866, 2006. 18. Hunter RE. 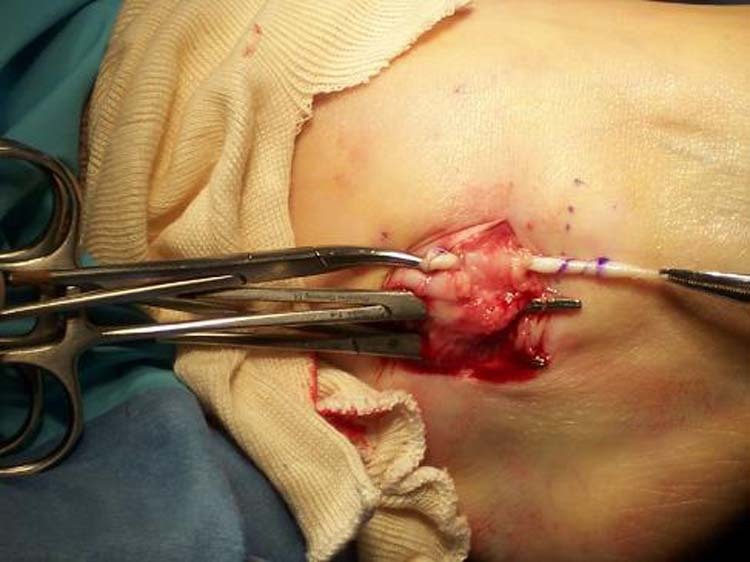 Allograft vs. Autograft in ACL Reconstruction. Medscape Orthopaedics & Sports Medicine eJournal 3(6), 1999. 19. Johnson W. Inamasu J, Yantzer B, Papangelou C, Guiot B. Comparative in vitro biomechanical evaluation of two soft tissue defect products. J Biomed Mater Res B Appl Biomater. April 2007. Foot Associates of New York, 60 East 56th Street, New York, NY 10022. 1Lecturer, Department of Orthopaedic Surgery, Columbia University Medical Center, New York, NY; Private 2Practice, Foot Associates of New York, NY. 10022. 3Submitted as Fellow, Weil Foot and Ankle Institute, Des Plaines, IL. 60016. 4Fellowship Director, Weil Foot and Ankle Institute, Des Plaines, IL. 60016.